Many have been asking if I am making these drivers available to the DIY community. A select number will be setup for that purpose. Please check the store for availability. Currently there are a few tweeters in a car mount available. And I am playing with the idea of a shallow frame high xmax 6.5 and 8 inch driver. Check out the Product Polling page. I regularly keep an eye on it and use it for determining where I will be putting forth the greatest efforts for small DIY driver runs. If you have interest in this feel free to drop me an email. I generally answer the same day. I have been handling payments via Credit Card payment. It is secure and easy for most. I'll post videos and links to all the drivers here as they are ready for general access. I thought I would be interesting to show the evolution of a drivers design by displaying the frequency response graphs of a particular driver design I have been developing. 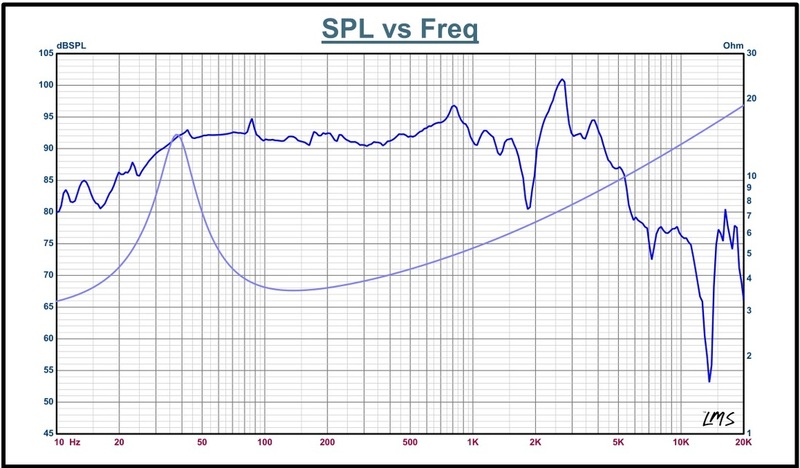 Below is a series of graphs that show the loudness of a driver in free air relative to a specific frequency. The frequency is is the bottom line and goes from left to right. The lowest frequency is on the left and the highest is on the right. The dark vertical lines are for counting your frequency points by tens, hundreds or thousands. And the loudness is shown by means of the vertical wiggly lines. Each darker horizontal division is 5 decibels. The lighter grey divisions are one decibel divisions. In the midbass section of 64 hertz up to 256 hertz most people readily notice a 3 decibels change in volume up or down in intensity. From 512 hertz up to 2048 hertz most people can discern about one decibels difference. For reference the lowest note on a six string electric bass is about 32 hertz. The lowest note on most acoustic double bass is about 44 hertz. Middle C on a piano is 440 hertz. The range of the human voice in general singing is roughly 110 hertz to 4000 hertz. So this is a comparison between a driver sold as TRIO8 and a replacement version that was created. The TRIO8 is the black line and the refined version is the red line. I put a little blurb about the low end of the frequency range because it is most easily discerned in the comparison graph. What is more pertinent to actual musical listening and enjoyment is the lower midrange from 200 hertz up to about 1800 hertz. This region is where most of the action in music takes place. So the graph above is the KA8NEO. All the graphs are high resolution without any smoothing used. They show any potential breakups and peaks as they actually occur. The little sharp peaks are the breakups. They are usually resonances in the cone, the voice coil former or the surround. Happily I have been able to tame out most of them. That dip at 1800 hertz is due to there not being a dust cap for this measurement. As a bit of a plus the low end has substantial improvement over the two predecessors as well. So a much cleaner midrange and much greater bass authority as well. Take a look at 50 hertz. There is almost a 8 db difference in efficiency. Not an easy thing to design into a driver that is basically the same Sd. This driver will be made available in a dual 4 ohm voice coil configuration that will allow some interesting possibilities for the end user. This is the first stage of a very high power very long throw subwoofer motor. Our coil is 100mm in diameter, and constructed with some of the best high temp adhesives possible. The coils are made in North America. I try to find the best balance between quality, then cost. This is a true no holds barred designed to the max driver. Most of the build parts are completely custom. The coil, spider, magnet and motor are all one of a kind. An XBL version similar to the old TC Sounds Beehive motor. Although I have a little secret sauce in the mix! Longer excursion and a decent SPL as well.